For Padraig, finding himself face to face with the man he'd loved and lost a lifetime ago is the biggest thing on his mind. Padraig Monaghan has a problem. Most would consider dying in a bar fight ten years ago upsetting, and existing as a ghost wandering the world might be thought a real predicament. They might deem a second chance at life through a chance encounter with a dying man a serious dilemma. But for Padraig, finding himself face to face with the man he'd loved and lost a lifetime ago is the biggest thing on his mind. Gareth Reilly stops at O'Toole's for a drink before he heads home. Tomorrow's going to be another lonely birthday for him until he's approached by a stranger. There's something about Padraig's bright green eyes and Irish accent that reminds Gareth of a man he once knew. Unable to resist, Gareth breaks his cardinal rule and invites Padraig home. 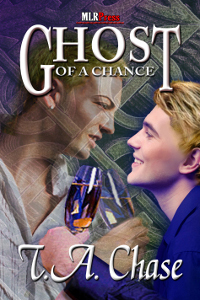 On St. Patrick's Day, when Irish magic is strongest, it'll take a belief in the impossible and help from a grateful elf to give Padraig and Gareth another chance at love.